Are you looking for a new outdoor security camera? Do you like the look of the Nest outdoor camera but you want to check out something more reasonably priced? Let me introduce the YI outdoor camera and see how these two cameras are the same and different. You might find that a better priced alternative. Firstly, let’s take a look at a chart that displays some of the main specifications. This camera has a resolution of 1080p at 20 frames per second. It uses a lens with a 3.9mm focal length and it has x4 digital zoom. This camera also has a resolution of 1080p but it is at a higher frame rate of 30 frames per second. It uses a 3 megapixel color sensor and it has a higher digital zoom, x8 in comparison to the YI camera’s x4. In practice, the resolution and image quality of both cameras in daylight really are very impressive. Colors are vivid and deep, fine details (such as individual stones on a gravel path or leaves on a tree) can be seen clearly. This camera has a 110° field of view. This camera has a 130° field of view. Well the Nest camera’s field of vision is very, very impressive and helps to monitor larger areas. The quality of its picture does not seem to suffer from having such a wide view. The YI Outdoor promises a night vision range of 50 feet or 15 meters. Of course, this all depends on the levels of light that might be around. Do you have any outside lights or is it a clear night with a full moon? I tested this camera on clear evenings with the lights from the rooms at the back of my house on. The camera has 12 infrared LEDs placed in a circle around the lens. In practice, the YI Outdoor can see objects that are 15 meters away but the details will be very vague and blurred- particularly if they are moving. In fact, if an object is too close to the camera at night, there will be a lot of glare (from the LEDs) on an object and details will be hard to make out. As you get further away from the camera, the image quality improves and things such as facial features can be seen more clearly. Details such as the individual leaves on a tree or a garden ornament can be seen clearly about 7 or 8 meters away. The Nest Outdoor, on the other hand, offers a night vision range of only 20 feet or 6 meters but once again this will depend on a few factors such as the light levels. In practice, large stationery objects such as bins or garden chairs can be identified clearly at about 5 meters away. Finer details picked up at night by this camera are good at a distance of about 3 metres. This includes the outlines of large logos on sweatshirts or of being able to identify the breed of a dog because of the level of detail. The LEDs in both of these cameras will give off a faint red glow when they are working at night. Separate activity regions (motion zones) can be created and monitored. Sensitivity levels can be adjusted between low, medium and high. The camera features a motion activated built in alarm. Adjust the frequency with which you receive alerts. Create a weekly schedule of when motion detection is on or off. However, the YI Outdoor doesn’t only act as a basic motion detection camera, by which I mean as a camera that only starts to record footage as a motion event, it can also record non stop, day in and day out. This 24/ 7 or CVR (Continuous Video Recording) capability can only be activated via a subscription to YI Cloud. Here are the different options and costs, on a per camera basis. 7 days of storage, the subscription will cost you $66 per per year. 15 days of storage, the subscription will cost you $9.99 per month or $99 per per year. 30 days of storage, the subscription will cost you $19.99 per month or $199 per per year. The Nest can detect motion and/ or sound. Sound and motion detection can be turned on or off. Sound or motion alerts are sent via the app or the via email. Yet the real power of the Nest Outdoor camera is only unlocked when you pay for a subscription to Nest Aware- the company’s cloud storage system. Activity zones or motion zones. 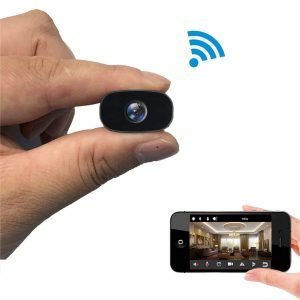 Live View is the ability to connect to your smart security camera from your phone or tablet and see what the camera is filming now and watch the footage live. Mute- you can listen to the camera’s built in microphone. Talk- press the microphone icon in order to start a conversation with someone standing next to the camera. Snapshot- press the camera icon to take a photo of the screen- the photo is stored in the photo app on your phone. The Live View screen contains a timeline beneath it that shows all of your stored videos. You can move between these clips by scrolling up and down. If you want to use The YI Outdoor with your iPhone or iPad, you need to make sure that your device is running iOS 8 or later. The good news is that you can control your YI camera by using a Windows or Mac computer. You need to download and install a free piece of software in order to do this. Windows users should click or tap on the green “Windows” button on this page. Mac users should click or tap here. The situation is very different for Nest Outdoor camera users. Firstly, the Nest app for iPhones and iPads requires iOS 9 not iOS 8 in order to work. In terms of Android devices, unlike with the YI camera, the version of the Android software that needs to be used varies by device! But it is not as complicated as it sounds. Using your phone or tablet, just visit the Google Play app and search for Nest. Google Play will display whether your device is compatible with the Nest app or not. And if you want to access your Nest camera from a Windows or Mac computer then you can. Instead of downloading software, you can access the camera via a browser. The YI Outdoor camera has two options for storage- micro SD and Cloud plan. The Nest has only 1 storage option- Cloud. The YI camera can store footage on an SD card. The maximum size of the micro SD card that you can use is 32 GB. You will need to purchase the card separately and they cost less than $15 on Amazon. On average the card should be able to store about 10 hours of footage from your YI camera. The advantages of a micro SD card is that it is a one off expense, whereas a cloud subscription costs money every month. The disadvantage of a micro SD card is that if the camera is stolen, your footage is lost as well. If you pay for cloud storage you keep your footage even if your camera is stolen. There are two types of plan- standard and premium. A standard plan is for when you want to use your outdoor camera as a motion activated device- your device only records short video clips after it detects a motion. A premium plan is for when want your YI camera to record continuously 24 hours a day 7 days a week. Each plan has 3 different levels; 7 days, 15 days and 30 days. Standard plans allow you to store footage from up to 5 cameras whereas a premium plan only stores footage from 1 camera to be stored. YI only offer storage as part of their subscription plans, they do not offer any extra features as part of a subscription. A subscription to Nest’s cloud storage service does offer extra functionality. Nest Aware is much simpler than YI Cloud. There is one type of plan and three different levels; 5 Days, 10 Days and 30 Days. The prices are for 1 camera- there are discounts for users who have multiple Nest cameras. And so although Nest Aware has fewer options and therefore easier to understand, YI Cloud offers more flexibility and is better value for money. Both of these smart security cameras are weatherproof. They have an industry recognised IP (Ingress Protection) rating, which is a rating that all the best outdoor devices have. The YI Outdoor and the Nest Outdoor both have an IP Rating of 65. A product with a rating of IP65 is totally dust proof and very waterproof. Five on the waterproof scale means that these cameras remain dry when they are sprayed by jets of water for about 15 minutes in all directions. Both of these cameras need to be plugged into an electrical outlet in order to be powered. The YI Outdoor camera has a 10 foot (3 meter) lead as does Nest Outdoor. The leads are “hard wired” into the body of the camera and then at the other end of the lead is a USB adapter that plugs into a USB power brick. The YI Outdoor and the Nest Outdoor both connect straight to your WiFi network. 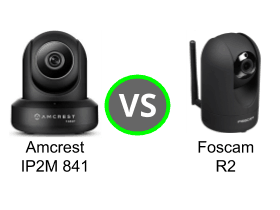 The difference is that the YI camera will only connect to WiFi networks that run at a 2.4 Ghz speed whereas the Nest will connect to 2.4 Ghz and 5 Ghz networks. Both of these cameras have two way audio. This means that the camera has a built in microphone and speaker which allow a conversation to take place between someone who is close to the security camera and a person who is connecting to the camera via an app. Both of these cameras have a live view facility. This is where you can connect to your camera directly via the app on your phone or tablet. In order to set up your camera you will need to download the YI Home app on your phone. You will need to create an account. This video will walk you through the process. Finally, make sure that your phone is connected to the same WiFi network that you want to connect your YI Outdoor camera to. Step 1- Plug your camera in and wait for the voice prompt welcome message- yes the camera will start talking to you. Step 3- On the top right of the page, press the “+” icon. Step 4- From the list of different cameras, select YI Outdoor. Step 5- Tap on “next”. An audio prompt will say “waiting to connect”. Step 6- Enter your WiFi password. Step 7- A QR code will appear on your screen. Point the camera at the QR code. This camera has value for money and quality written all over it. This is the perfect camera for Nest and Google fans who don't mind spending more for a brand that they love!